Compiled by David Nash Rector of Rivenhall\} Charles Callis "Baron WESTERN"
Since the Rear Admiral never lived at Felix Hall, let alone Rivenhall - although he is credited with having spent much of his early childhood at Rivenhall Place, it seems highly probable that he is buried at Aldham, - presumably Essex where the Church, 1855 is built out of material from an older building. (We have visited Aldham Suffolk, but the church has no Western memorial. The Aldham church Burial register of 1814 should give his age at death, We know that he was not buried here at Rivenhall; only "Old" Thomas &Maximilian amongst his ancestry have this distinction. We see no reason to dispute December 1814 as the Rear Admiral's time of death. See Burke for 1847. we believe that his portrait must have been painted between the time of Trafalgar and 1814 on grounds of promotion and age. * The portrait, artist unknown, came into the possession of Rivenhall Parochial Church Council early in the second world war. On Sunday October 8th 1939 a report was given to the P.C.C. on a "recent visit of Miss Western, of 19 Courtfield Road London S.W.7. She asked that the portrait of Admiral Western should be hung in the (Church) Hall as soon as possible, since it would be damaged by children if left in its present position, she would pay the bill". Prior to the sale of this hall in June 1974, the portrait was photographed and moved to Rivenhall Place. 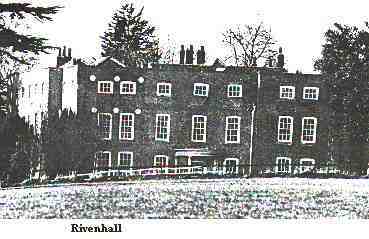 It was cleaned by a Colchester firm on the instructions of MR David Stapleton, who then owned the "Place" and was then being hung on the main staircase,- where it still is (March 1976) The present owner of Rivenhall Place is Mr Nicholas Callingham-Wilkes. 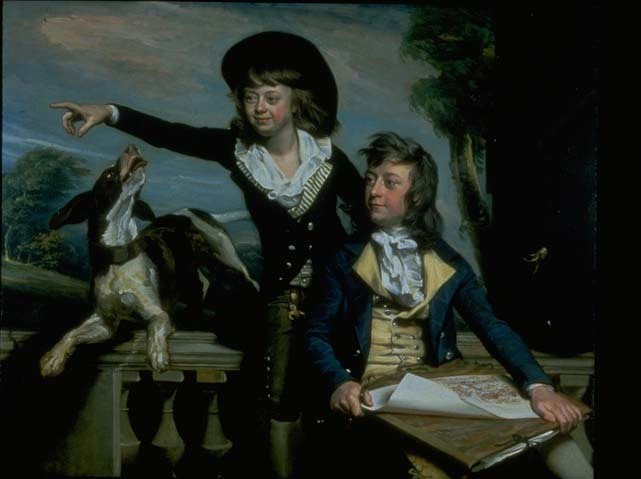 *His portrait here refers to that at Rivenhall Place and not to the one exhibited in the Constable Exhibition at the Tate Gallery in the Spring of 1976. This Rivenhall canvass stands 9 feet high by 5' - 6'" approx. 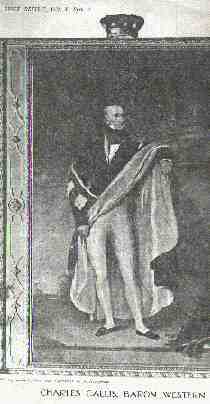 The Rear Admiral, slightly larger that life-size stands on the fore-shore in his dress uniform, his right hand upon a large anchor, his left hand holding his sword. He appears to be a man of over sixty years of age, though by no means senile. 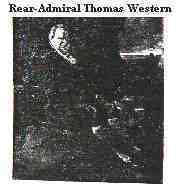 We possess a photo of a portrait by F. Grant R.A. of Thomas Burch Western, 1864 (aged 68 yrs) The Admiral in his portrait, looks younger than the son in his! On a Western Pedigree obtained from Mrs Joan Western Cody, of Ontario, Canada, April 1975, we discovered an extra item of information not apparent on our copies of the family tree. The Admiral is said to have been born in 1761; this would make him about 33 yrs. on his wedding day; only 53 at death. On the basis of this reasoning we would reckon, considering the comment made about Western appearing to be in his sixties, we must conclude that the date of our portrait is nearer 1814 than 1810. Charles eldest surviving son was the one left out since he erected the plaque at Rivenhall. at the time of his father's death, this Charles was under 20 & unmarried; "handsomest man in the University of Cambridge". so said a friend?.. of Cole (Hardly surprising!) He married "Frances Shirley Western formerly Bollan" That she was a Western widow at the age of 22, before this marriage is highly questionable. Frances' mother had died when Frances was born in Boston Mass. "Dining with my sister Jane, July 22 1771, at Mr Thorpe's chamber,- the President of St. Katherine's Hall, I heard the melancholy and disagreeable news that poor Mr Charles Western, eldest (Surviving) son of my late dear friend Thomas Western of Rivenhall in Essex, Esq.- going in his new phaeton with a pair of new coach horses, which had cost him but that week, or a few days before £140,.. on some occasion or other, the horses got the mastery and ran away with the chaise,.. when Mr Western, finding it impossible to stop them, imprudently jumped out,.. and in so doing was killed on the spot. His lady, with great prudence watched an opportunity to fling her little boy out on a safe place (Next article suggests this was the future Lord Western),.. and soon after jumped out herself and escaped danger. They were going from Rivenhall to his seat at Preston in Sussex, when this sad accident happened...." ## ## From "Essex Worthies" by William Addison Published by Phillimore & co 1973 Page 198. Amendment to scene of accident reads - " (( This was at his estate at Preston in Sussex and it was said to have been caused by the horses taking fright when Mrs Western also in the chaise with one of her two children, draw out a handkerchief. She threw the child into a bush - where he landed safely, and managed to slow the horses. This child was almost certainly the eldest i.e the future Lord Western... the baby left behind at home was the future rector Shirley Western):contributor Rev David Nash) Cole added that the lady was a most agreeable young woman. Charles was only 24; If it was the elder son who was the "little boy" mentioned then he would have been about 4 years old; his younger brother would have been little more than 2. (There had been another son, Richard, who died in 1770 only about a year before this tragedy) The mother died after a 2nd widowhood ? of 44 years. aged 69 on 5 October 1815. This 2nd widowhood idea arises from the notion that she was a widow when she married Charles, and that her previous husband had been a Western. she was buried at Rivenhall, as "Frances Shirley Western, 70 Years"
Source: Essex Worthies by William Addison Published by Phillimore & Co Ltd 1973 Page 198. Will dated 27 April 1844 Proved 19 Feb. 1845 Entailed Estates on Thomas Burch Western succeeded to Rivenhall 1789 Bought Felix Hall Kelvedon. Created Lord & Baron of Essex 1833 MP for Essex. Of Felix Hall Kelvedon died age 77. Adm Queens College Cambridge 11 Nov. 1784. Never married branch extinct in male line. January 1833 created by the King "Baron WESTERN of Rivenhall" and took his seat in the "House of Lords" Travelled in Italy 1825 & 1826 Purchased many valuable antiques and commissioned Bertolini and other well known artists to execute for him copies of some of the most famous treasures of the galleries of Naples, Rome and Florence. The parliamentary life commenced before he was 23 years old and continued uninterruptedly for 42 years. He became one of the leading promoters of the "Corn Bill 1815" Charles Callis (Lord Western) purchased Felix Hall having sold the Sussex property of Preston Near Brighton for £17000. Parliamentary Career Ended 1868. Created a Baronet & in 1869 was appointed by Queen Victoria, Lord Lieutenant & Custos Rotulorum for the country. He died at Felix Hall, on 30th May 1873, a few months after his wife Margaret Laetitia, daughter of William Bushby of Kirkmichael, Dumfrieshire. His only surviving son, Thomas Sutton Western, M.P. for Maldon from 1857-1865, succeeded him in the baronetcy, but died only four years later than his father, on 20th June 1877. He married, on 3 Feb 1848, Giuletta Romana, daughter of Sir EdwardManningham Buller, Bart. She died 20 Sept 1850, leaving an only child, Sir Thomas Charles Callis Western, during whose non-residence at Felix Hall the mansion was let to other persons. He to had no son, but numerous other direct descendants of Maximilian Western remain..and it is hoped that at some future time the name so long and honourably connected with the county of Essex will be once more revived within its borders, and a Western will again be living at Rivenhall or at Felix Hall. 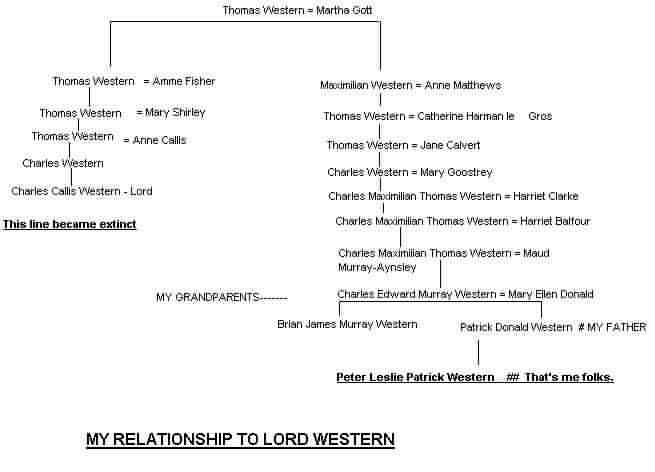 After the death of Lord Western in 1844, the Rivenhall & Kelvedon estates (but not the peerage) went over to Thomas Burch Western who was Lord Western's 4th Cousin: Lord Western had never married. 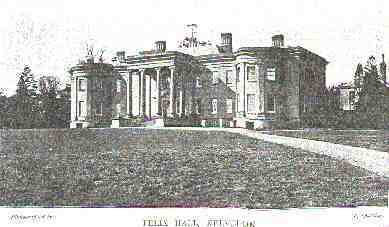 Thomas Burch Western had moved to Felix Hall, Kelvedon and in 1864 had been created (1st) Baronet - when Thomas Charles Callis Western was in his early teens. Grandmother (Margaret Laetitia) died just before Christmas in 1872 and grandfather Thomas Burch Western survived her only until 30th May of the following year. T.C.C.Western's father, Thomas Sutton Western succeeded to the title on 2nd Baronet Western and presumably moved his seat from Tattingstone to Felix Hall - where he certainly lived for some time. But that time was short-lived since he died on June 19th 1877 aged 55 yrs. He was buried at Tattingstone, and so at the tender age of 26 yrs. 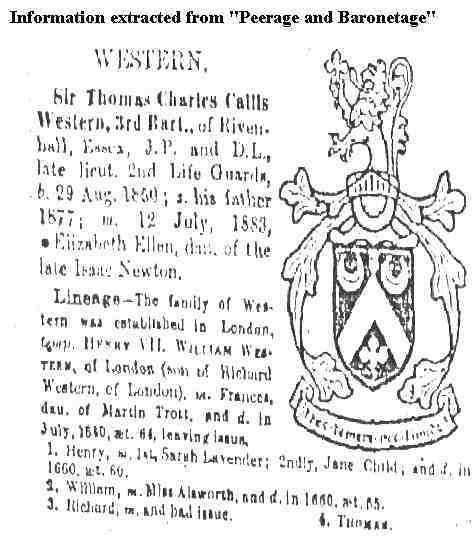 Thomas Charles Callis Western became the 3rd Baronet. (He never took up residence at Felix Hall).